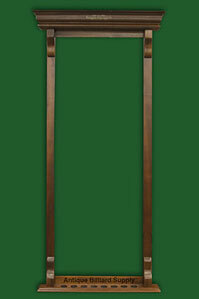 #5-02 Outstanding two piece wall-mounted pool cue rack of a style to accent the Brunswick Monarch antique pool table or other tables from the Victorian era. Extremely rare with decorative turnings on both top and bottom sections. Holds 12 cues. 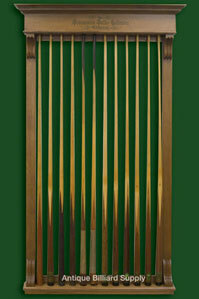 #5-04 Unusual old wall-mounted Brunswick cue rack with pearl accents at each corner. Perfect compliment for Brunswick Kling, Brunswick Arcade, and other similar antique pool table models. Fluted sides with matching accents on the crown section. Birch and ash construction, dark walnut finish. Holds 12 cues. 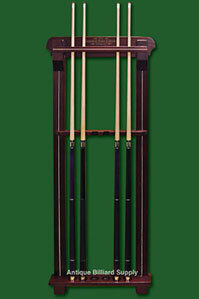 #5-05 Mission style pool cue rack. Solid oak construction with dark brown finish. Old Mission design, with heavy structural elements visible throughout. 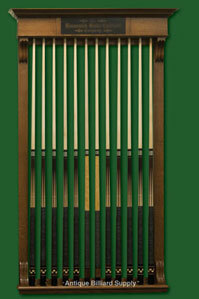 Displays 12 cues. 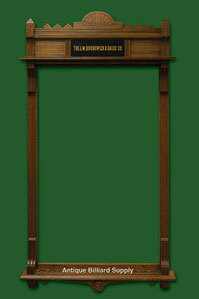 #5-06 Victorian era Brunswick wall-mounted cue rack. Crown design is accented with the unusual detailed trim piece across the bottom. From the 1880s, this exceptional piece would compliment many models of early Brunswick pool tables. Oak construction with mission-style dark brown finish. Holds 12 cues. #5-09 Early wall-mounted Brunswick antique cue rack. 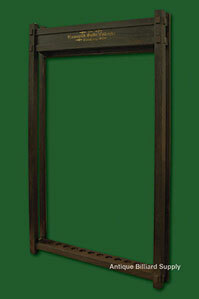 Solid oak construction with dark brown finish. Original gold leaf decal remains in good condition. Accent carvings across crown and down each side. A perfect compliment to any antique Brunswick pool table. Holds 12 cues. 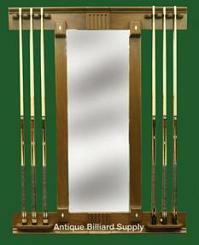 #5-10 Exceptional wall-mounted cue rack with recessed detail. Oak construction with dark brown finish. Accent crown section and fluted vertical side boards. A perfect compliment for many antique Brunswick pool tables. Holds 12 cues. 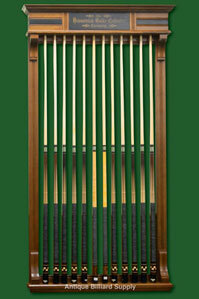 #5-11 Outstanding Brunswick wall-mounted pool cue rack with dark center panel in crown section. Solid oak construction with dark brown finish. A quality accent piece for any antique Brunswick pool table. Holds 12 cues. 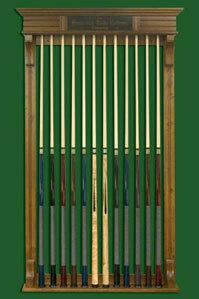 #5-13 Primitive cue rack of massive appearance. Rugged construction and simple design makes it a perfect accessory for Brunswick antique pool tables of mission style of arts and crafts period. 30 inches wide, 16 inches deep, holds 36 cues. #5-17 Combination Coat Closet and Hat Rack by Brunswick. Coat is hung inside, six cues racked on each side, and hat goes on top. Oak finished in dark walnut color. 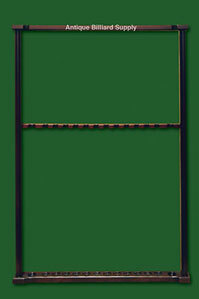 Inlay pattern of holly and mother-of-pearl to match many models of Brunswick antique pool tables. 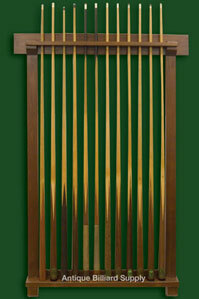 #5-18 Wall mounted cue rack with wide vertical accents on crown section. 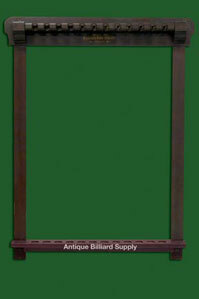 Solid oak with dark brown finish to compliment a wide variety of antique pool tables. 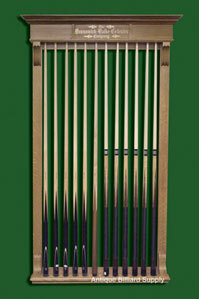 Displays 12 cues. 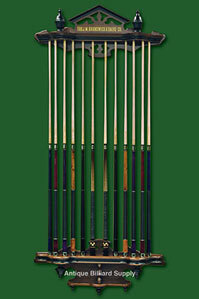 #5-24 Masculine appearance from this uniquely primitive antique pool cue rack. Smaller size makes it perfect for use when wall space is limited. 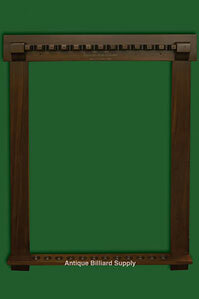 An excellent accessory piece for antique pool tables of arts and crafts or mission designs. Birch construction with dark cherry finish. Holds six cues. 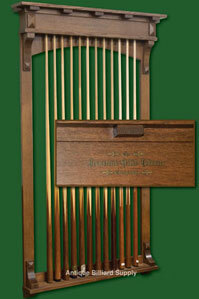 #5-26 Custom mahogany rack holds eight cues instead of the usual 12. Perfect for the billiard room where wall space is limited. 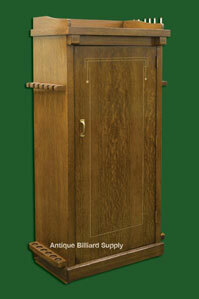 #5-28 Very nice antique cue rack of the type provided with variety of antique pool tables in the 1920s and 1930s. Slotted top bar limits damage to cue shafts. Birch construction finished in dark walnut color. Holds 12 cues. 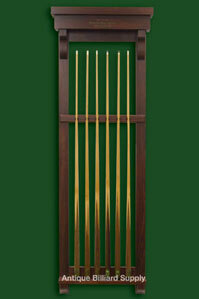 #5-29 Wall-mounted Brunswick antique cue rack with original gold leaf in a style that compliments many types of Brunswick antique pool tables. Birch construction with original dark cherry finish. Original Brunswick logo from the early 1900s. Holds 12 cues. 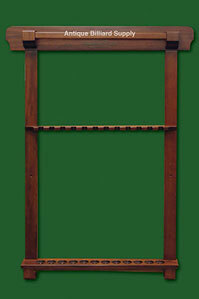 #5-30 Great looking economy antique pool cue rack to compliment any Brunswick antique pool table. Solid poplar construction with medium brown finish. 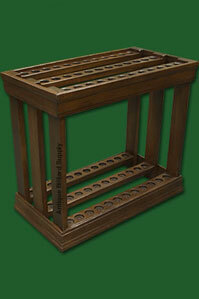 Mission style to accent any of several antique pool tables of similar design. Easily mounts to wall with four screws. Holds 12 cues. 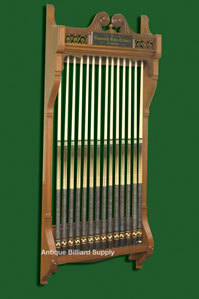 #5-31 Unusual Brunswick cue rack with large vertical elements and decorative blocks at each side of the crown section. 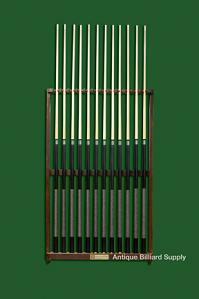 Cues are retained with hand-crafted leather strips to avoid damage. Holds 12 cues. 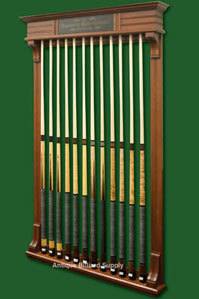 #5-32 Classic Brunswick antique cue rack of the style that was provided with many Brunswick antique pool tables of the 1930s and 1940s. 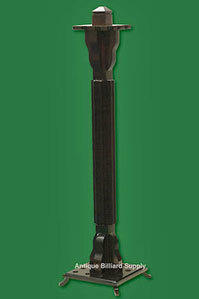 Birch construction with original dark mahogany finish. Original Brunswick nameplate at bottom center. #5-33 Unusual Brunswick wall-mounted cue rack. Extra wide with one slot at each side to accommodate bridge or other long items. 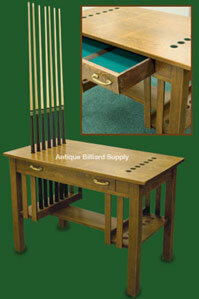 Simple design would compliment many models of Brunswick pool tables. Slotted top bar limits damage to cue shafts. Birch construction with dark cherry finish. 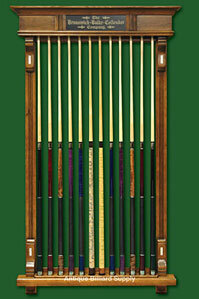 36 inches wide, holds 12 cues and two accessory pieces. 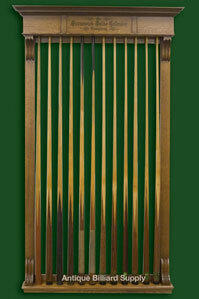 #5-34 Rare wall-mounted Brunswick antique cue rack in the art-deco design of the 1940s and 1950s. 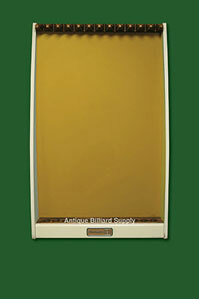 Perfect compliment for Brunswick Gold Crown I, Gold Crown II, and other similar pool table models. Cast metal Brunswick nameplate at bottom center. Unrestored, very nice original condition as shown. Holds 12 cues.